I’ve come to really appreciate how much a good necklace can pull an outfit together. This necklace was inspired by one I had seen at Anthropologie a few years ago, and is really easy to make. Like the beaded wrap bracelet, this necklace makes a great gift and you have a lot of freedom to make it your own! I used 4 different types/colors of beads, using a total of ~360 beads (~90 beads each of 4 different types). You can do more or less types of beads, and the total amount you'll need will vary depending on the size of your beads and length of each section. You should decide beforehand what order to string your beads on each side of the necklace, and how long each section will be. You can choose to be symmetrical, but I chose to have each side be the reverse order of the other. Decide how long each section will be. I wanted each section to be ~1-3 inches long, and counted how many beads it would take for each section to be the length I wanted. 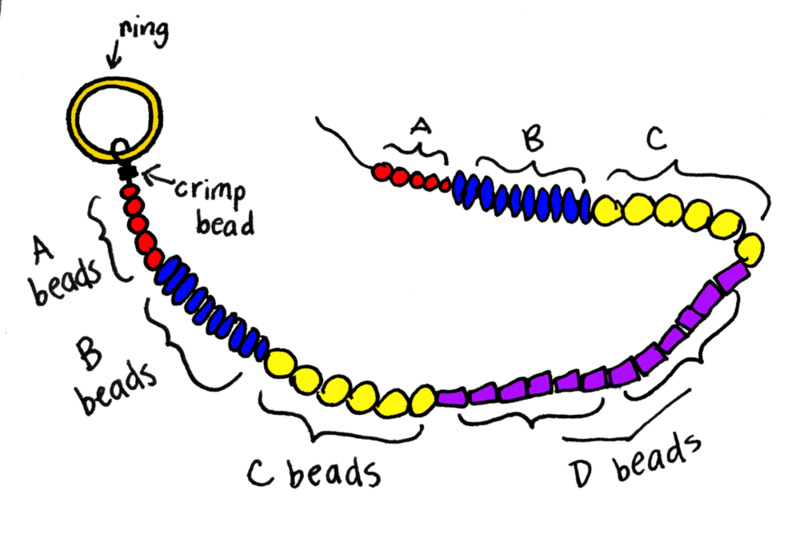 Remember that the beads are stranded in a loop. So, when beading, you will want to make each strand symmetrical from the center. Cut about 14 inches of beading thread. String one end of the thread through a crimp bead (or 2, if double-securing), loop around the medium sized ring, and then thread the end back through the crimp bead. Adjust the thread so that only ½ to 1 inch of the thread end extends past the crimp bead(s). Using your pliers, gently grip the crimp bead, move it as close to the ring as possible, and apply firm pressure to flatten the crimp bead. (Repeat for the second crimp bead, if double-securing.) This will secure your strand of beads to the ring. If you mess up, you can squeeze the folded corners of the crimp bead with the pliers to open it back up, take it off, and try again with a new crimp bead. Cut off the end of the thread so that only a few millimeters remain after the crimp bead(s). String on your first bead to the thread, and make sure the bead also covers the few millimeters of thread coming out of the crimp bead. This adds extra security and covers loose ends. Continue stringing on beads in your desired order and section length. Finish the string of beads by attaching the end to the ring. After you’ve strung on your last bead, string on a crimp bead (or 2, if double-securing). Loop your thread around the same ring you did before, string the end of your thread back through your crimp bead and the bead next to it (the last bead of your strand). Holding the open crimp bead with your pliers, gently pull your thread (which is now strung through the crimp bead and one regular bead) so that the loop around the ring becomes as tight as possible, and barely any thread is visible between any beads. Repeat steps 2 and 3 for two more strands. (Note: it doesn’t matter where you attach each strand to the ring for this first side). When you’re finished, you should have 3 loops of beads attached to your medium ring. See diagram below. Now for the other side of your necklace! 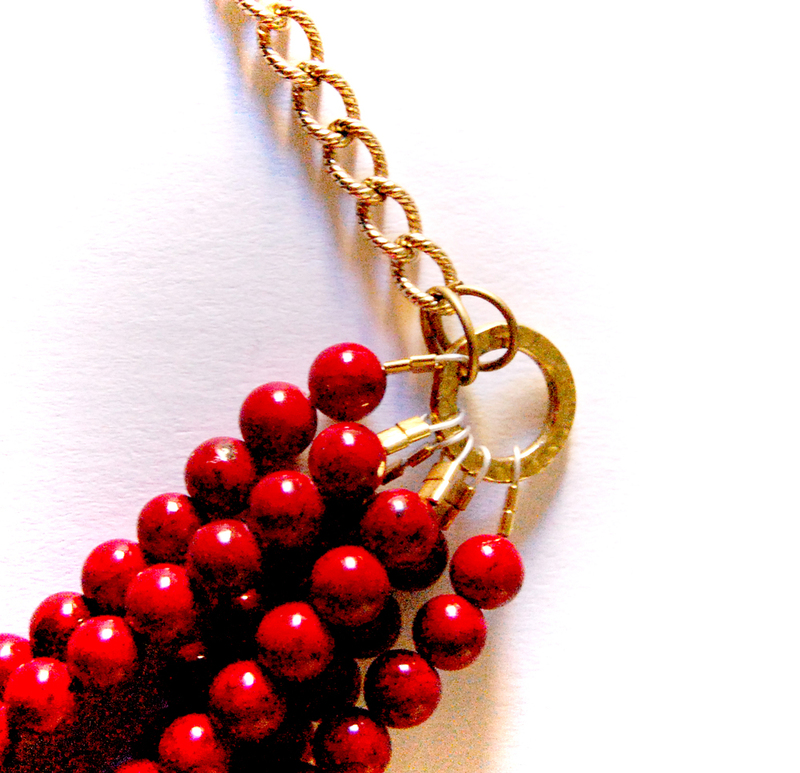 String on your beads in your desired order for this side of the necklace, which may be different from the first side! For me, it was the opposite order of my first side. Now for the finishing touches. First, attach one piece of chain to each ring. Open one jump ring slightly (using hands or pliers), and hook the jump ring through both the medium ring (to which the bead strands are attached) and one end of your chain. Close the ring carefully. 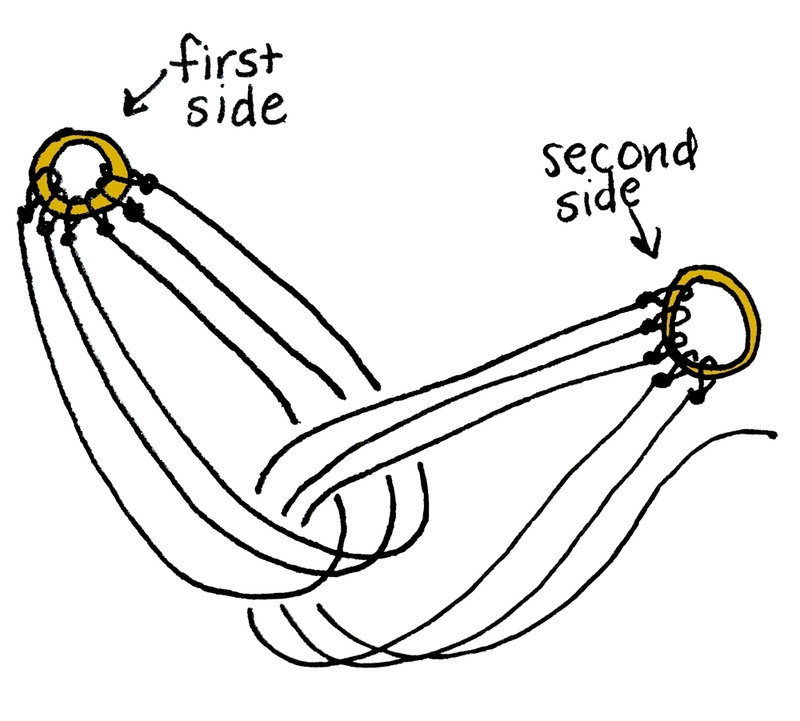 If double-securing, repeat on the same side, so that there are 2 jump rings securing the chain to the necklace. You can probably get away with 1 jump ring, but I used 2 to be safe! 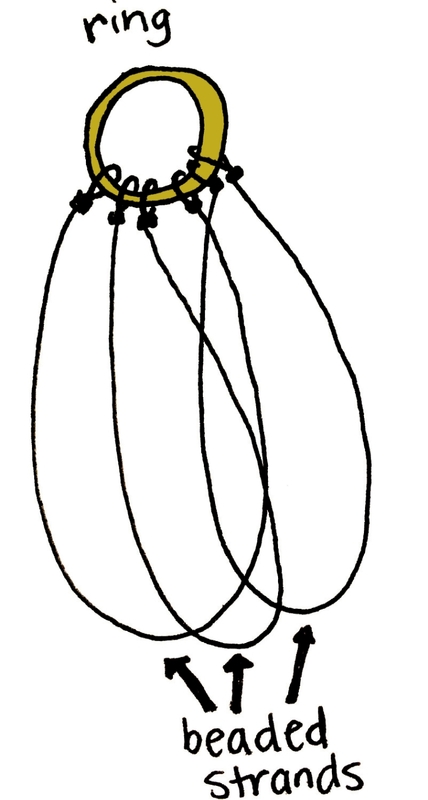 Complete the necklace by attaching the clasp, using the same technique with jump rings in step 6. Open one jump ring, hook it through one side of the jewelry clasp, and attach to the end of your chain. Close the jump ring. Repeat for the other side of your necklace. Step 5. Loop second side strands through loops of first side. Now admire the fine beadwork you've just done, and pat yourself on the back for making your own Anthropologie-inspired necklace!